Last week, the Government of British Columbia announced the laudable goal that by 2040 all new cars and light trucks sold in the province would be zero emissions. As the provincial government strives to reach its legislated climate targets, B.C.’s incoming zero-emission vehicle (ZEV) mandate will make a significant contribution towards cutting personal transportation greenhouse gas (GHG) emissions. These emissions, accounting for about eight megatonnes of GHGs, comprise half of B.C.’s road transportation emissions, the province’s largest source of carbon pollution. To reach B.C.’s 2030 GHG reduction target, other important transportation measures are needed. These measures should include support for community electric vehicle charging networks, sustained transit investment linked to better land-use, and a heavy-duty vehicle strategy. However, there’s another opportunity that can’t be overlooked: building on novel 100% renewable transit leadership within the province. 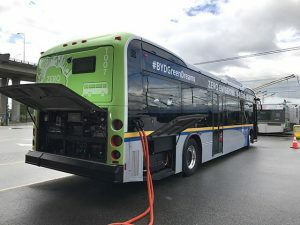 A zero-emission bus strategy for B.C. Recently, Greater Vancouver’s transit authority, TransLink, adopted a 100% renewable energy strategy. 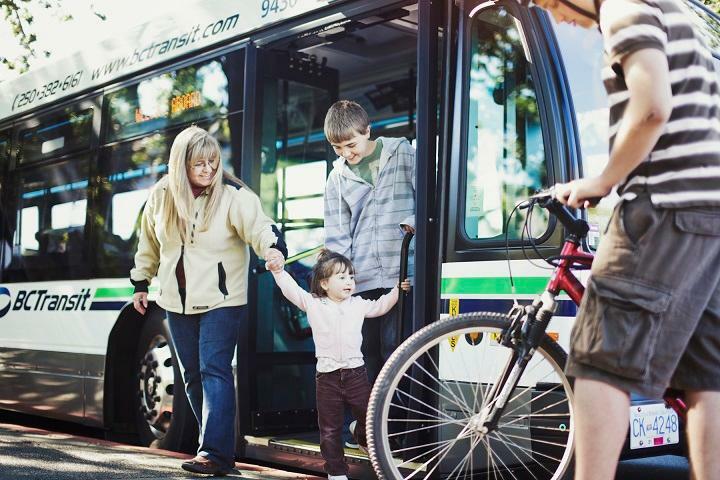 While it operates only 2,000 buses, TransLink’s strategy can inform a roadmap for decarbonizing the province’s total stock of 10,000 plus buses, including fleets operated by BC Transit, schools and private companies. If such a strategy was pursued province-wide, B.C. could realize a reduction of almost half a megatonne of GHG reductions annually, the equivalent to removing almost 200,000 cars from the road.1 This would be a cost-effective measure to contribute to the 26.5 megatonne reductions necessary to meet the province’s 2030 climate target. However, there’s more to this opportunity than just cutting greenhouse gas emissions. TransLink’s analysis shows that—with expectations for big reductions in battery costs over time—there is a compelling financial case for its 100% renewable energy target. With a full capital replacement program phased in by the mid-2020’s, TransLink’s strategy will cut operating costs and result in net savings of $24-50 million annually. Cleaner fuels and fleets will also significantly reduce one of B.C.’s largest sources of criteria air contaminants: diesel combustion. 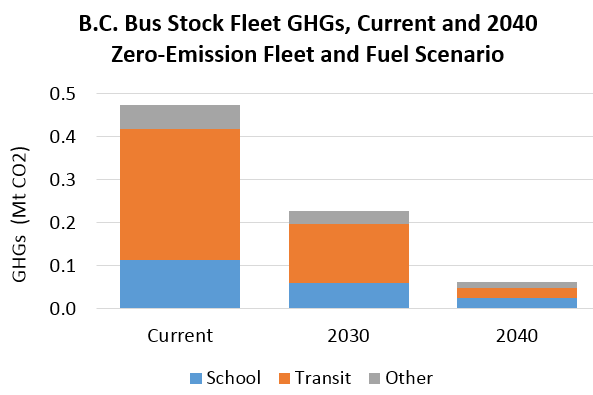 To achieve the GHG reductions associated with a transformation of the province’s bus fleets, the Government of British Columbia would need to build on its bold ZEV mandate with a zero-emission fleet and fuel procurement strategy across all bus categories. Ultimately, the market will define the bus procurement pathway, based on the unique activity profile and the economic and infrastructure implications of different routes and fleets. With the right policy, however, transit authorities, school boards and other operators can be nudged towards renewable fleets and fuels to meet their unique needs. 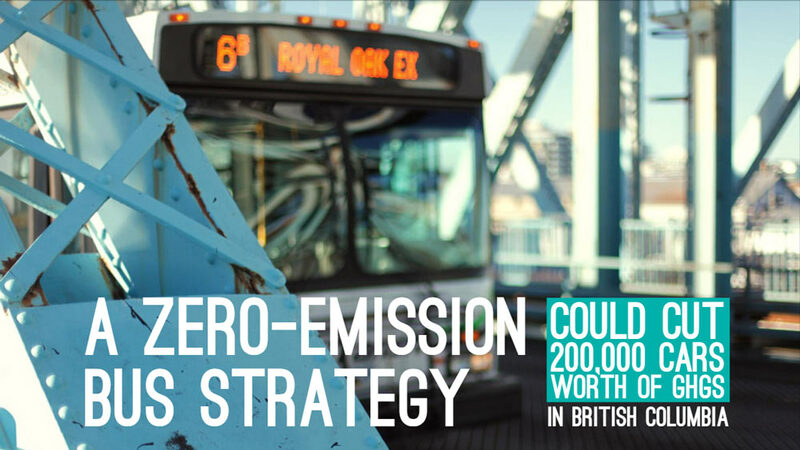 With a zero-emission bus strategy in place, British Columbia will be able to capitalize on GHG reductions, cleaner and quieter streets, and cost-savings. Learn more about the zero-emission fleet and fuel for buses scenarios produced by Renewable Cities. On Wednesday, November 28, 2018, officials from King County Metro and TransLink presented their transit zero-emission/100% renewable energy strategies at a public event hosted by Renewable Cities. See the video here. Read Renewable Cities’ executive director Alex Boston’s op-ed in the Georgia Straight. 1 More precisely, an effective zero-emission fleet and fuel strategy for buses could reduce about 250,000 tonnes of GHGs annually by 2030 and 410,000 tonnes by 2040. This is equivalent to eliminating 112,000 cars from the roads by 2030 in terms of today’s fuel consumption, or 186,000 cars by 2040 (assuming an average of 2.2 tonnes of GHGs per typical B.C. car, based on Natural Resources Canada vehicle data).